Don't want to carry Cash? This is the ticket for you!! This purchase allows you to use a credit/debit card and guarantees admission (even if the line has been closed due to a Sell-Out). Ticket includes taxes and admission to the haunted attraction. All OnlineTickets includes any cover charges for Celebrity Appearances.... TicketLeap will add additional handling and processing charges to the price of each ticket. The tickets purchased are good only for the dates on the printed or mobile ticket and such dates purchased for this event. The ticket is void if not used for that date. Paper or Mobile ticket(s) required for admission. Tickets can also be purchased on location at the ticket booth, (cash only, ATM on site) unless the event is Sold Out for that night. No waiting, period. The TRU VIP Ticket allows you to bypass long waits, especially on the weekends. This purchase guarantees admission (even if the line has been closed due to a Sell-Out) and takes you from the VIP booth to the Cage entering the Haunted Attraction. Look for the VIP CHECK-IN located just outside the main entrance. The TRU VIP Ticket includes any cover charges, taxes, and admission to the haunted attraction. TicketLeap will add additional handling and processing charges to the price of each ticket. TRU VIP Tickets purchased are good only for the dates on the printed or mobile ticket and such dates purchased for this event. The TRU VIP Ticket is void if not used for that date. TRU VIP Ticket(s) can also be purchased on location at the ticket booth, (cash only) unless the event is sold out for that night. No waiting, period. The ULTIMATE VIP DATE PACKAGE Ticket(2) allows you to bypass long waits, especially on the weekends. This purchase guarantees admission (For 2 people) (even if the line has been closed due to a Sell-Out) and takes you from the VIP booth to the Cage entering the Haunted Attraction. 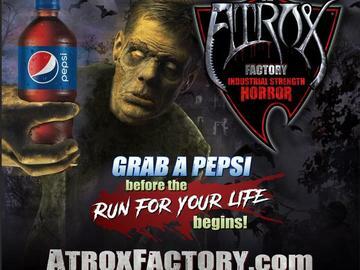 (2) Atrox Factory T-Shirts (sizes and quanties limited)..
(2) Fountain Drink of your choice. (2) ALTERED STATE 4-D EXPERIENCE admissions "NEW FOR 2018"
The ULTIMATE VIP -Fright Night-DATE PACKAGE Tickets (2) includes any cover charges, taxes, and admission to the haunted attraction. TicketLeap will add additional handling and processing charges to the price of each ticket. The ULTIMATE VIP -Fright Night-DATE PACKAGE Tickets (2) purchased are good only for the dates on the printed or mobile ticket and such dates purchased for this event. The ULTIMATE VIP -Fright Night-DATE PACKAGE Tickets are void if not used for that date. The ULTIMATE VIP-Fright Night-DATE PACKAGE Ticket(s) can also be purchased on location at the ticket booth, (cash only) unless the event is sold out for that night. HOLD ON FOR AN ENTIRE NIGHT OF SCREAMING YOUR HEAD OFF!!! The SCREAM PASS ticket allows you to bypass long waits, especially on the weekends. This purchase guarantees admission (even if the Line has been closed due to a Sell-Out) and takes you from the Main Entrance (VIP BOOTH) to the Cage entering the Haunted Attraction. Re-enter the Cage Que line and go through ATROX FACTORY as many times as you can in the SAME NIGHT! All you care to get scared! Look for VIP CHECK-IN located just outide of the Main Entrance. The SCREAM PASS tickets purchased are good only for the dates on the printed or mobile ticket and such dates purchased for this event. The SCREAM PASS ticket is void if not used for that date. If you are prone to Motion Sickness, Loud Noises, Fog, Strobe lights,Intense Sounds, claustrophobia, etc. No Refunds or Exchanges....(add on only, cannot be purchased without buying an admission ticket and must be used the same night as the purchased ticket)..
Atrox Factory is CLOSED on Mondays and Tuesdays (Except on Halloween Night/Week and Special Events) Check Calendar on atroxfactory.com for dates..
Atrox Factory reserves the right to refuse admission to anyone. You will experience intense audio, lighting, extreme low visibility, strobe lights, fog, damp or wet conditions, moving floors, special effects, sudden actions, and an overall physically demanding environment. You should NOT ENTER this attraction if you suffer from asthma, heart conditions, prone to seizures, physical ailments, respiratory or any type of medical problem, and are pregnant or suffer from any form of mental disease including claustrophobia. DO NOT ENTER the attraction if you are intoxicated, wearing any form of cast, medical brace, using crutches, or have any type of physical limitations. Do not enter the attraction if you are taking medication or using drugs of any type. You will not be admitted if any of these conditions are to be noticed by our staff. DO NOT smoke, run, eat or drink inside the attraction. Additionally there is no touching of the actors, customers, or props inside the attractions. No video or flash photography may be taken inside this attraction. You will not be admitted and asked to leave the property if any of the rules are not followed.